So I am no longer a "working girl". I put my notice in yesterday. I'm finishing up a few projects and then that will be that. Sometimes I wish it was easier for me to feel settled and happy in a work situation, but this time around it wasn't a match. I was also working with family and I learned that mixing personal relationships with professional ones is just not my cup of tea. In the end it's no ones fault, it just wasn't the right fit. I have some ideas of what I want to do next but I'm sort of exploring it and taking my time. I am going to take some "home life" time. We have a lot of renovations that need to be scheduled and moved forward on. I am also going to take some craft classes, hoping for baking and sewing ones! One day I want to write poetry again without panicking while I stare at a blank screen. I also have to work on re-building the garden (one of our dogs had to be hospitalized from eating corn in the garden! Luckily she is healing!). I need to put a gate around it to keep the pups out and move it to a different spot in the yard. I also have been propagating succulents and love it, but I need to get more going. I need more window space and have been wracking my brain for ideas on how I can put more plants in the house. My craft desk is now going to be a "plant nursery"! I have this whole bohemian life dream where I live simply and quietly and contentedly. The two most important things for me are freedom and congruence. Freedom to be myself, freedom to love and care, freedom to express. I also want congruence, for my internal life to match and sync up with my external life. When I am living that way I am genuinely happy and it feels great. So that is what I'm moving towards. More congruence. More freedom. 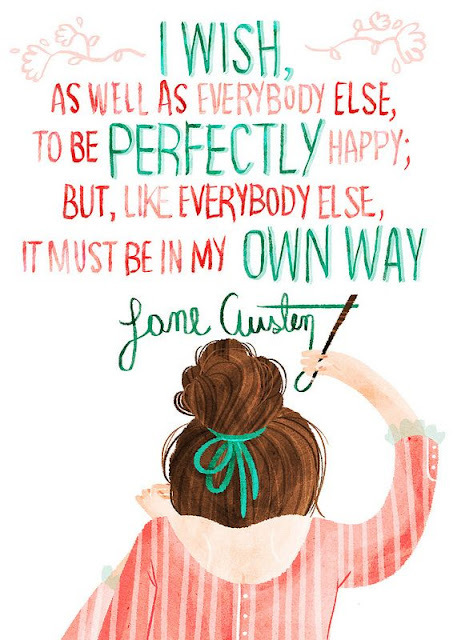 Like Jane Austen, I have to make my own way. I am excited for you. If I had the ability to leave my job, I would. I am hoping to when the baby comes. You have to follow your heart, always! Best of luck to you in your pursuits.